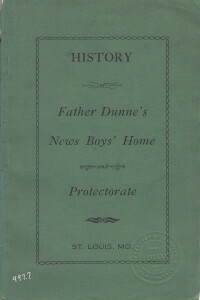 Father Dunne’s News­boys’ Home and Pro­tec­torate, as an orga­ni­za­tion, will be 108 years old this com­ing Feb­ru­ary. Back in 1931, dur­ing the 25th anniver­sary cel­e­bra­tion, the St. Louis Globe-Demo­c­rat rec­ol­lect­ed that, “A mys­te­ri­ous ‘Friend of the Home,’ who has nev­er per­mit­ted his name to be known, began his min­is­tra­tions at [at the Home on] Sel­by Place, send­ing every now and then a wag­onload of pro­vi­sions and leav­ing with Father Dunne, gifts of mon­ey, always anony­mous­ly. In those ear­ly days it is prob­a­ble the home could not have exist­ed but for this friend. Suf­fice it to say that his inter­est has nev­er abat­ed. A boun­ti­ful Thanks­giv­ing din­ner every year since then is one of his out­stand­ing bene­fac­tions.” This is the sto­ry of who that anony­mous bene­fac­tor was. 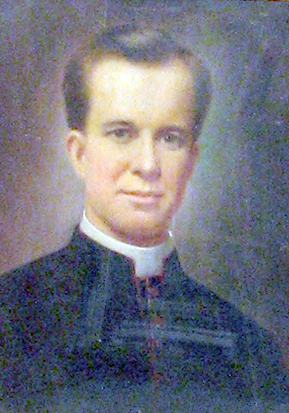 The future Father Peter Joseph Dunne was born June 29, 1870 in Chica­go. 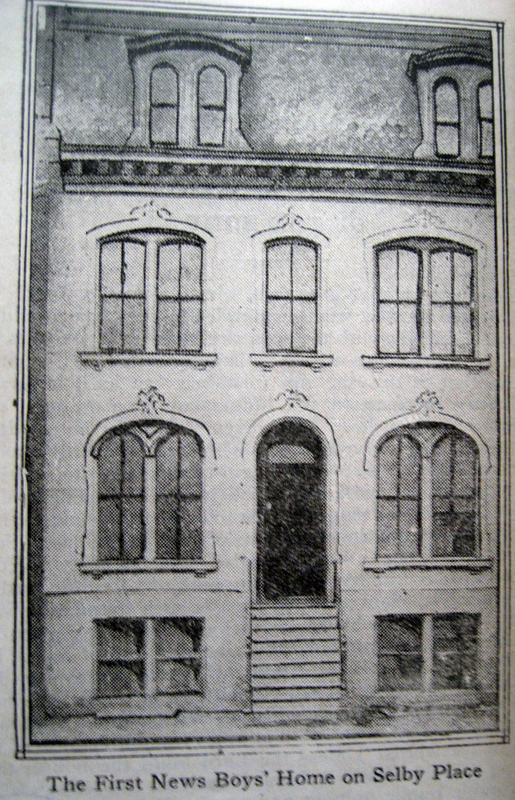 His father was a car­pen­ter, but both his par­ents did not enjoy good health, and the fam­i­ly moved to a small farm in Kansas in 1873 to get away from “the sti­fling city streets.” Nev­er­the­less, Peter Dunne’s moth­er died in 1879 and his father took Peter and his four sib­lings to reside in Kansas City, Mis­souri, where Peter’s father died three years lat­er. An orphan at the age of 12, Peter was employed in a print­ery, but lat­er found work at the Catholic Orphans’ Home for Girls in Kansas City where his sis­ters resided. Work­ing var­i­ous odd jobs and appren­tice­ships through age 24, Peter moved to St. Louis in the win­ter of 1891, where he first was a team­ster, then, after pan­ic of 1893, became night watch­man at Saint Louis Uni­ver­si­ty. cel­e­brat­ed their first Thanks­giv­ing. The St. Louis Repub­lic head­line read “Prince of Mys­tery Stuffs News­boys,” and described “that feller” – as the news­boys referred to the donor – as a “dis­tin­guished-look­ing, hand­some and a thor­ough aris­to­crat in his bear­ing” who watched as the 56 res­i­dents ate turkey, dress­ing, rolls, fruit, nuts, pie, cake, and ice cream, all served by wait­ers “who looked as if they might have stepped out of the Ara­bi­an Nights.” At each boy’s plate were a dol­lar bill, a box of Busy Bee can­dy, and a toy turkey. The anony­mous bene­fac­tor would go on to spend approx­i­mate­ly $1,000 every Thanks­giv­ing for the next 25 years to pro­vide a sim­i­lar feast. It was only after the donor’s death in 1931 that Father Dunne offi­cial­ly iden­ti­fied the spon­sor as Hugh Camp­bell, Jr., the mil­lion­aire son of Robert Camp­bell. Ban­quets occurred year after year, seem­ing­ly grow­ing in excess (and cer­tain­ly in the num­ber of res­i­dent boys) over time. 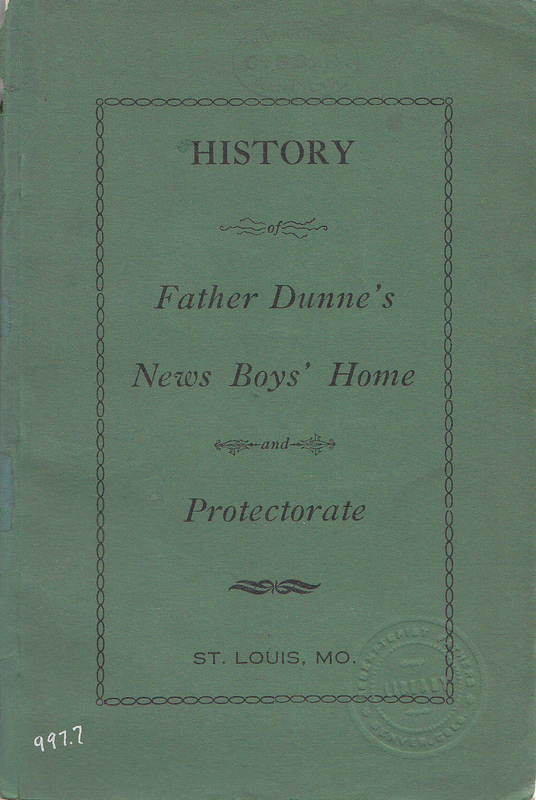 On Novem­ber 10, 1907, just before the occa­sion of the sec­ond Thanks­giv­ing ban­quet, Father Dunne’s News­boys’ Home and Pro­tec­torate moved to brand new and even larg­er quar­ters at 3010 Wash­ing­ton Avenue, at the cor­ner of Wash­ing­ton & Gar­ri­son avenues. This was the result of dona­tions from 30 local busi­ness­men, with Hugh Camp­bell alleged­ly pro­vid­ing the bulk of the funds. The Home could now pro­vide for at least 125 boys, and more over time. By 1909, news reports record­ed not only the sump­tu­ous feast (always catered), but accom­pa­nied by a stringed orches­tra (most often De Martini’s), that would enter­tain the boys with patri­ot­ic Amer­i­can or live­ly Irish music. Each meal began with a prayer of thanks for the unknown bene­fac­tor, who seemed to attend in the ear­ly years, but less fre­quent­ly as the years passed. At its’ height, the Thanks­giv­ing ban­quet pro­vid­ed no less than 600 pounds of turkey to feed upwards of 200 boys. The news­boys referred to the stranger who pro­vid­ed the din­ners as “that feller” or “Mr. 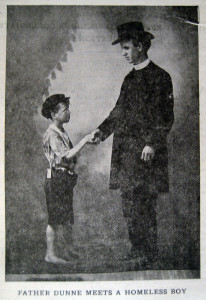 Mur­phy.” Hugh Camp­bell report­ed­ly told Father Dunne that his dona­tions were to remain anony­mous, and if his name ever got out, the News­boys’ Home “would nev­er get anoth­er nick­el.” He also told the priest, “You had bet­ter take what you can while I’m liv­ing because my will is made and you will get noth­ing when I die.” It was only after his death on August 9, 1931 that the extent of his gen­eros­i­ty to the News­boys’ Home was made known. Dur­ing one of the Camp­bell estate law­suits, in 1933, Father Dunne tes­ti­fied that Hugh Camp­bell first came to the Sel­by Place res­i­dence in 1906 after read­ing about the new home in the news­pa­per. We know now that Hugh has always had an inter­est in these types of char­i­ta­ble orga­ni­za­tions, hav­ing donat­ed to the cre­ation of a “Street Boys’ Home” in St. Louis in 1877. Hugh also gave Father Dunne mon­ey, in addi­tion to the cart full of food, and con­tin­ued to pro­vide for the home and spe­cif­ic boy’s in par­tic­u­lar through the years. Besides the Thanks­giv­ing ban­quets, start­ing in 1906, Hugh donat­ed the mon­ey for con­struc­tion of the Wash­ing­ton Avenue build­ing in 1907. In 1908 he donat­ed por­traits to the Home of Father Dunne, Car­di­nal Glen­non, and the “orig­i­nal news­boy” Jim­my Flem­ing, in addi­tion to funds for the mar­ble altar in the chapel. 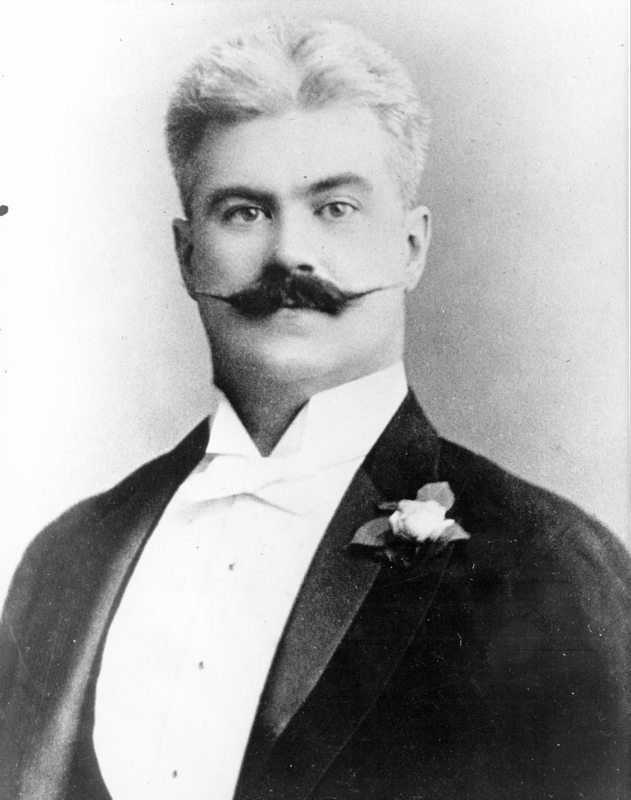 In 1909 he pro­vid­ed the mon­ey for the facil­i­ty swim­ming pool. 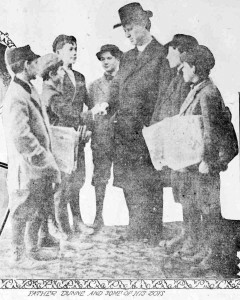 Hugh also sent sev­er­al of the boys through the Ranken School of Mechan­i­cal Trades, bought one boy an arti­fi­cial leg, sent “fruit enough for six months” with the Thanks­giv­ing day din­ners, and fur­nished the Home’s 75 piece band with uni­forms. 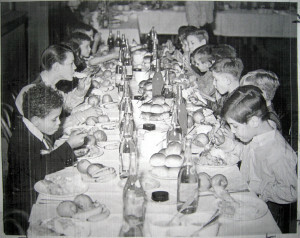 After Hugh’s death anoth­er “unknown bene­fac­tor” pro­vid­ed the Thanks­giv­ing meal in 1931. The ban­quets con­tin­ued in the ensu­ing years, but news reports nev­er again empha­sized the extrav­a­gance of the feast. 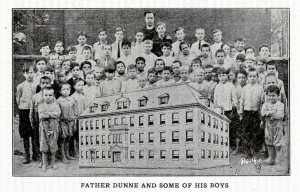 Father Dunne died in March 1939. 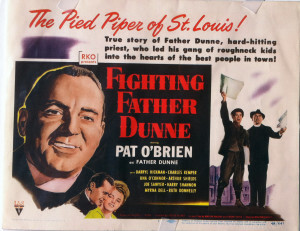 In 1948, RKO pic­tures released a movie “Fight­ing Father Dunne” star­ring Pat O’Brien as Father Dunne, a fic­tion­al­ized low bud­get response to 1938’s MGM pro­duc­tion of “Boy’s Town.” This despite the fact that Father Dunne’s News­boys Home and Pro­tec­torate had pre­ced­ed Father Flanagan’s orig­i­nal home for home­less boys by 10 years and Boys’ Town by 14. The News­boys’ Home and Pro­tec­torate con­tin­ued through the years. It remained at 3010 Wash­ing­ton Avenue, but in 1947 was reor­ga­nized and placed under the Catholic Char­i­ties depart­ment of chil­dren. In 1956 the home cel­e­brat­ed its 50th anniver­sary at the Wash­ing­ton Avenue loca­tion. 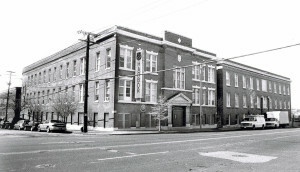 In July 1970 the build­ing at 3010 Wash­ing­ton Ave was sold to the Sal­va­tion Army and Father Dunne’s News­boys’ Home moved to 4253 Clarence Ave (the build­ing at 3010 Wash­ing­ton Avenue still stands today and was vacat­ed in May 2013 by the Sal­va­tion Army). The con­cept of the home­less news­boys had changed over time, and ser­vices were pro­vid­ed for trou­bled and emo­tion­al­ly dis­turbed youth. 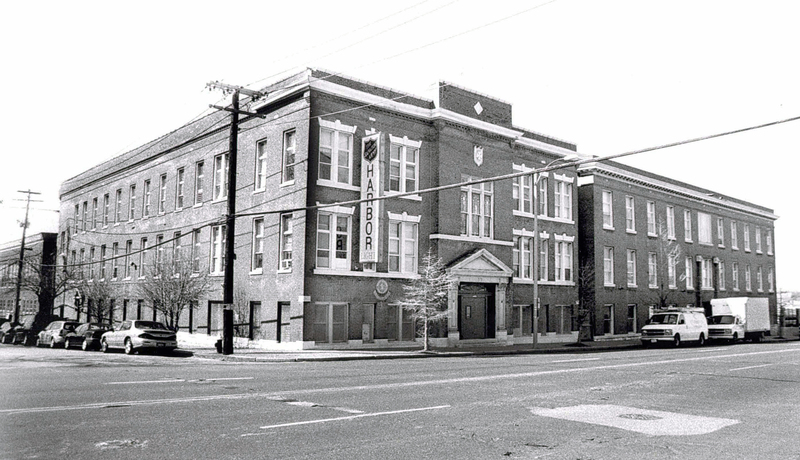 In 1988, the News­boys’ Home moved to 853 Dunn Rd (on the cam­pus of the for­mer Aquinas High School). 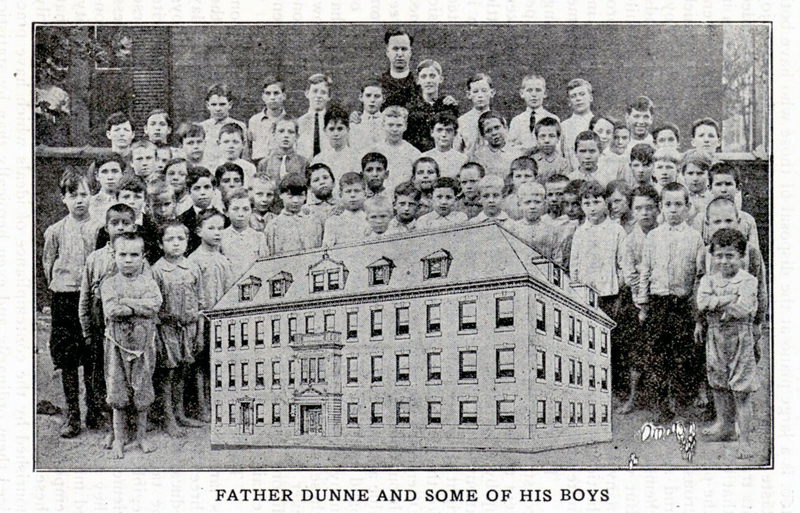 In 2006, “Father Dunne’s Old News­boys’ Home,” a Catholic Char­i­ties’ agency pro­vid­ing res­i­den­tial ser­vices for boys in fos­ter care, ages 12–21, was one of five agen­cies that merged to form Good Shep­herd Chil­dren & Fam­i­ly Ser­vices. **Spe­cial thanks to CHM Senior Research Tom Gron­s­ki for guest-writ­ing this blog post. This entry was posted in Campbell and tagged Cardinal Glennon, Father Dunne, Father Dunnes' Newsboys' Home, Fighting Father Dunne, Good Shepherd Children & Family Services, Hugh Campbell, Intrepid Researcher Tom™, Jesuit, Newsboys, Orphan, Robert Campbell on November 27, 2013 by Andy Hahn.